The finance industry encompasses a broad range of organizations that manage money, including credit unions, banks, credit card companies, insurance companies, consumer finance companies, stock brokerages, investment funds and some government sponsored enterprises. Financial institution and a financial intermediary accepts deposits and channels those deposits into lending activities, either directly by loaning or indirectly through capital markets. A bank is the connection between customers that have capital deficits and customers with capital surpluses. Due to their influence within a financial system and an economy, banks should be and are generally highly regulated in most countries. Most banks operate under a system where they hold only a small reserve of the funds deposited and lend out the rest for profit. They are generally subject to minimum capital requirements which are based on an international set of capital standards, known as the Basel Accords. The oldest bank still in existence is Monte dei Paschi di Siena, headquartered in Siena, Italy, which has been operating continuously since 1472. Banking in its modern sense evolved in rich cities of Renaissance Italy, such as Florence, Venice and Genoa. In the history of banking, a number of banking dynasties—among them notably Medici, Fugger, Welser, Berenberg, Baring and Rothschild—have played a central role over many centuries. A "commercial bank" is what is commonly referred to as simply a "bank". The term "commercial" is used to distinguish it from an "investment bank," a type of financial services entity which, instead of lending money directly to a business, helps businesses raise money from other firms in the form of bonds (debt) or stock (equity). Financial landscape is going to change. Big data, innovation of payment systems and the blockchain are the ones who started it. A new business type, the cognitive bank, emerges and makes use of FinTech innovations and the new invented methodology of the blockchain. Focus is security versus convenience. Big data disrupted financial services because of high volume, light velocity and high variety (social media, data produced by the internet of Things, which drive fundamental shifts, data contained in emails). Through machine learning, the use of big data can benefit both customers and providers by further personalising services or improving security in processes. But big data also triggers specific risks for financial services in relation to data privacy, the quality of data, the exclusion of the "riskiest" profiles, the ethics of algorithms. General Data Protection Regulation (GDPR) can address these risks and a European Data Protection Supervisor (EDPS) is focussing amoung others on digital etchics. There is far-reaching digital transformation of financial services, but numerous policy issues and questions remain unresolved. On the back of the fast growth in e-commerce, dramatic changes in the expectations of customers and gradual maturing of enabling technologies, the development of innovative payment solutions has been the main driver so far behind the wide digital transformation observed in financial services. 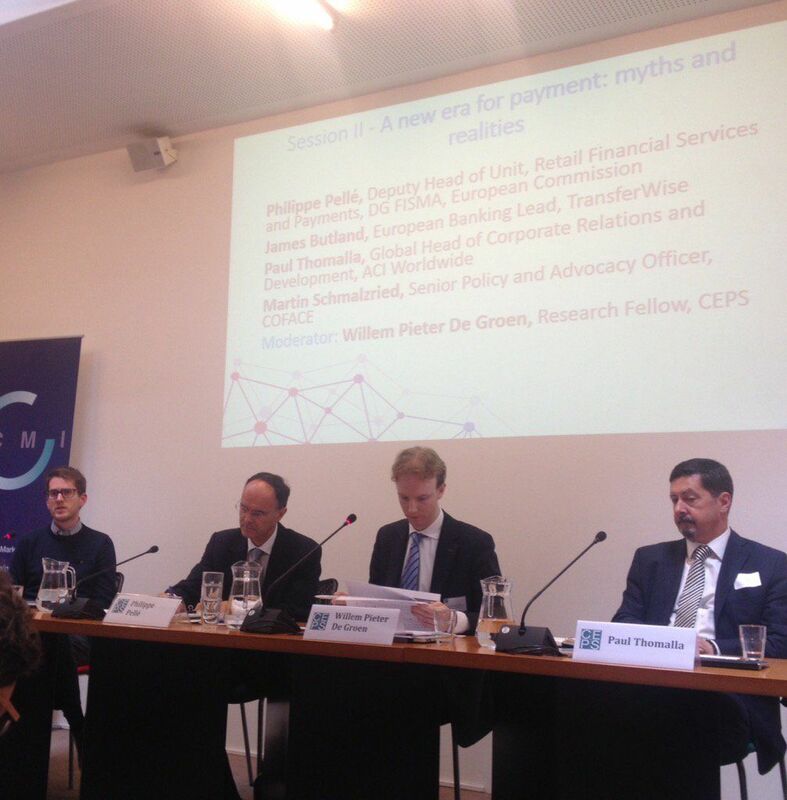 Against that background, it is no surprise that the sector has been the object of a large range of European rules: PSD2, MIF, SEPA. The objective of these rules is twofold: on one hand addressing the new risks triggered by digitalisation; on the other hand, contributing to shape the payment landscape of tomorrow. 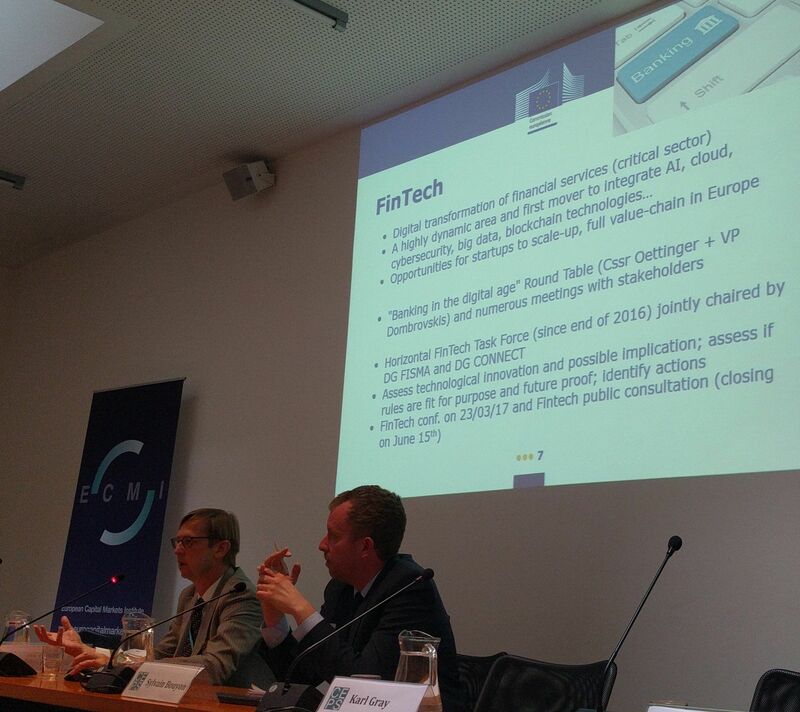 Various market actors - banks, customers, FinTech startups, clearing platforms - are effected by digitalisation and the regulatory package for payments and API's (application programming interfaces), a set of definitions, provide communication between other programs or components. The policies on banking and financial services are developed and carried out by DG FISMA, a function of the European Commission. Still in an early stage is bitcoins distributed ledger technology (DLT). The financial services industry need to enable further simplification, standardisation and transparency. For example, clearing and settlement and collateral management, record of ownership and securities servicing are other areas where the technology is most likely to bring useful changes. What's wrong with Europe's banks? is a question that did CEPS in July 2013. The sector is undercapitalised, too large and contains too many players without a viable long-term business model. It is the combination of the last two factors that constitutes the most serious and most difficult problem. What should be done is clear: recapitalise much of the sector and restructure those parts lacking a viable business model. But as this is unlikely to happen any time soon, it also unlikely that Europe can recover fully from its present slump. December 13, 2012, the European Union has taken a significant step towards establishing the banking union, in terms of the EU level supervision of European banks. EU Finance Ministers agreed on a series of measures that will see the European Central Bank take over the supervision of a whole host of European banks. In a banking union supervison on financial institutions is held at European level. Additional components are a European deposit insurance scheme that protects savings and a fund (ESM, European Stability Mechanism) that without interference from governments or regulators supports banks. But the crisis in the euro area continues to unfold. A threat to European integration and global growth, the internal imbalances of the EU require a comprehensive policy response. Which roadmap to follow to exit the crisis? How many capital markets for growth and in particular 'eurobonds' to contribute to revive the euro area? Mr. Olli Rehn, commissioner for Economic and Monetary Affairs, gave his take of the economic rebalancing that is going on in Europe and of our policy response to the debt crisis through a presentation. Ben Bernanke, president of the Fed, speeched 31-08-2012 in the presence of international bankers and economists during the yearly meeting in Jackson Hole in the USA. 'The bar for the use of nontraditional policies is higher than for traditional policies. In addition, in the present context, nontraditional policies share the limitations of monetary policy more generally: Monetary policy cannot achieve by itself what a broader and more balanced set of economic policies might achieve; in particular, it cannot neutralize the fiscal and financial risks that the country faces. It certainly cannot fine-tune economic outcomes'. APRIL 2012 SETTING THE INSTITUTIONAL and REGULATORY FRAMEWORK for TRADING PLATFORM: Does the MiFID definition of OTF make sense? A crucial element of MiFID II is the new trading venue category called ‘organised trading facilities’ (OTFs), and claimed as the equivalent of the US swap execution facility (SEF). The introduction of a new category of trading venue would be also in line with the early G-20 commitment, stating that“All standardised OTC derivative contracts should be traded on exchanges or electronic trading platforms, where appropriate, [...] by end-2012 at the latest.” (G-20 Toronto Summit Declaration, June 26-27 2010). A new legal definition of trading venue in Europe aims at capturing all hybrid bespoke or manual (semi-automated) mechanisms that allow trading of derivatives and other financial instruments, typically those ‘over-the-counter’. 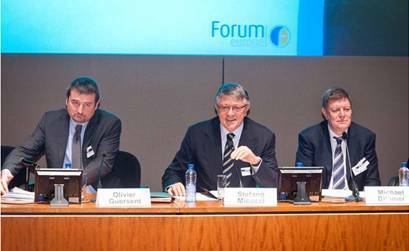 During a ECMI-CEPS lunch time seminar 6 March 2012, CEPS in Brussels, with the subject 'Sovereign Bond Markets in State of Flux', the equation “LTRO + ESM – PSI = LY” was revealed, roughly capturing investors’ perceptions of sovereign bond markets in Europe. 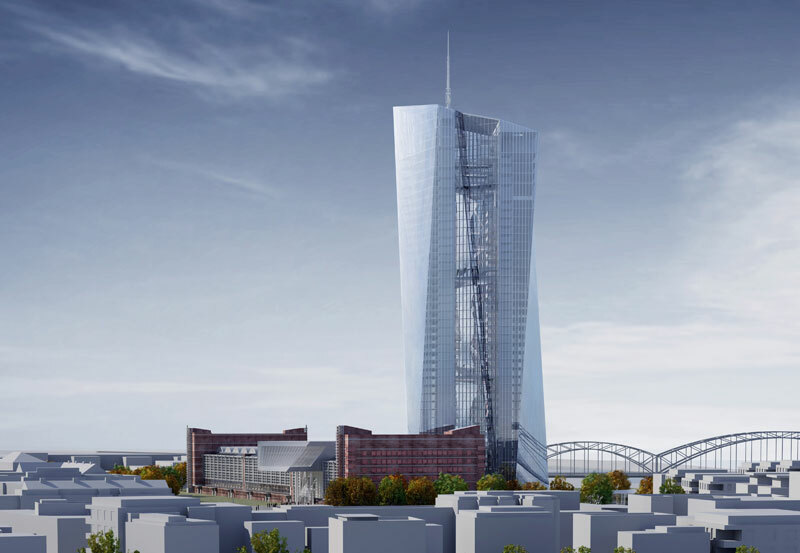 In effect, the longer-term refinancing operations (LTRO) carried out by the European Central Bank and the future European Stability Mechanism (ESM) are easing the pressures in sovereign bond markets and are seen positively by market participants. Yet private sector involvement (PSI) in the rescue package for Greece is believed to have had the opposite effect, undermining market confidence despite reducing moral hazard. As a result of the interaction of these three factors, investors are expecting low yields (LY) in Europe, coupled with uncertainties about the future. To overcome this impasse, experts and investors present at this seminar favoured common issuance, introduced progressively over the medium term, in combination with structural reforms, to make the equation work to the benefit of member states and their citizens. - The eurozone and global stability. "Interaction between financial regulation and investment in the real economy and, second, facilitating the access to capital of Small Medium Enterprises." Taylor rule: A monitary policy rule that stipulates how much the central bank would or should change the nominal interest rate in response to divergences of actual inflation rates from target inflation rates and of actual GDP from potential GDP. To provide a venue for discussing the effects that Capital Requirements Directive and the respective regulation will have on banks' business models, CEPS - ECRI co-hosted 8 December 2011 the event Banking business models. The 'one size fits all' approach of Basel III poses the same requirements for all banks with retail business models that have an important role as lenders to the economy. 14-10-2011 CENTRAL BANKING AFTER THE CRISIS: the role of central banking has been stressed. Central Banks are independent (a democratic responsibility), should maintenance price stability, support the stability of the financial system, and growth and high employment. This is the ideal situation how central banks has to function. In the global financial crisis that started in 2007, central banks in many countries engaged in a broad range of activities that were not part of their normal policies. Jean-Claude Trichet, President of the ECB, at the symposium on “Macroeconomic challenges: the decade ahead”, Jackson Hole, Wyoming, 27 August 2010, lectured: 'The financial crisis required prompt, decisive and innovative actions by central banks and governments around the world. In a lunchtime conversation, former Federal Reserve Chairman Greenspan identified major contributing factors and said breaks down 'greatest global crisis ever'. I've always been in favor of the principle of sub-prime loans because I've always thought that minority homeownership in a capitalist society was highly desirable. Greenspan did outline his belief that higher or additional taxes taxes are an effective way to cut the national deficit but only in the short run. "The general conclusion that more people are coming to is that you cannot significantly contract fiscal problems through taxes. It will cure the deficit temporarily, but the problem is that the forces that generate it are still in play, and you'll continue to get the increase again. But if you cut spending permanently, it's a different base. 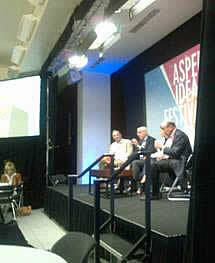 Other three financial experts gave different views on whether the financial crisis is really over. The United States has moved from recession to recovery. Now it's going to require patience to move from recovery to expansion. Fortunately, Obama realizes the problems posed by federal debt and plans to address it once the economy is stronger. The world is coming into balance thanks to the biggest global shift most people will witness in their lifetimes. October 2013, six years on from the start of the credit crisis, FT interviewed Alan Greenspan who published his new book 'The Map and the Territory'. 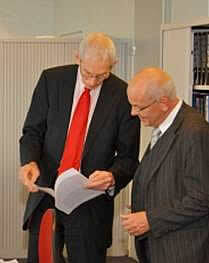 In Februari 2010 Daniel Gros from CEPS brought in the paper 'Design of a European monetary fund'. Member countries of the EU have signed up to the principle of solidarity, which is enshrined in numerous passages of the Treaty. Hence, they can expect to receive support when faced with extraordinary financing difficulties. At the same time, the principle of solidarity also implies that those countries that might in future constitute a burden on the Community should contribute to building up the resources needed for a potential support effort. Both considerations apply in particular to the euro area. Crisis in the eurozone and how to deal with it (Paul De Grauwe) from February 2010 points that one is led to the conclusion that the inability to create a more intense political union in the eurozone will continue to make it a fragile construction, prone to crises and great turbulence each time such a crisis must be resolved. While a grand plan for political unification does not seem to be possible, smaller but focused steps towards such a future union can be taken. Two such steps are worth mentioning here: creating a European Monetary Fund (EMF) and creating a common euro-bond market. Actual is also functioning of market infrastructures. Readiness of the buy-side for new regulations and new infrastructures, a trade-off between efficiency and safety, possibilities if new technological developments can mitigate operational risks and can increase the efficiency of the infrastructure. Thorough command of markets by governments is an opinion. But poverty in the midst of plenty (heavy increase of spending power versus quality decrease of services by public sector) should be avoided and state aid should be controlled, otherwise it is not an issue of compensation restricted in conformity with the market (Altmark judgement). Markets should be efficient, fair and prevent risks. But how to frame a whole market? ECMI and CEPS launched a new report. Januari 2010 it was discussed during the event ´How should market infrastructure be governed? The financial economic crisis has drawn a bill on cooperation within the EU. How has the EU react on the crisis? What lessons learned? What to do to prevent a next crisis? January 2010, due to a study of 'The role for the EU in the financial economic crisis', a short explanation was given on the role of the EU, whose role has been under exposed.ECRI organised a conference October 2009 on Responsible lending and financial education. Two years into the discussion of the causes of the financial crisis, it is evident that irresponsible lending practices on the one hand in combination with the lack of financial education on the other bear a fair share of the responsibility for stirring up the turmoil. Dealing with only one but not the other would be an incomplete policy. Following publication of the de Larosière report, however, the EU machinery has swung into action and is now delivering concrete proposals for the much-needed new European architecture for financial supervision published Daniel Gros on 22 June 2009 in 'Institution-building in action'. During a meeting by European Capital Markets Institute (ECMI) 31 March 2009 a huge gap between repairing reinforcement and reinforcement of financial stability on global level was discussed. It was examined how the legislative and structural changes initiated by the crisis are affecting investment, capital flows and the overall competitiveness of Europe's wholesale banking sector. Towards stronger coordinated supervision – macro-prudential and microprudential. Building on existing structures. Ambitiously, step by step but with a simple objective. Much stronger, coordinated supervision for all financial actors in the European Union. With equivalent standards for all, thereby preserving fair competition throughout the internal market. Towards effective crisis management procedures – to build confidence among supervisors. And real trust. With agreed methods and criteria. So all Member States can feel that their investors, their depositors, their citizens are properly protected in the European Union. In essence, we have two alternatives: the first "chacun pour soi" beggar-thy neighbour solutions; or the second - enhanced, pragmatic, sensible European cooperation for the benefit of all to preserve an open world economy. This will bring undoubted economic gains, and this is what we favour. 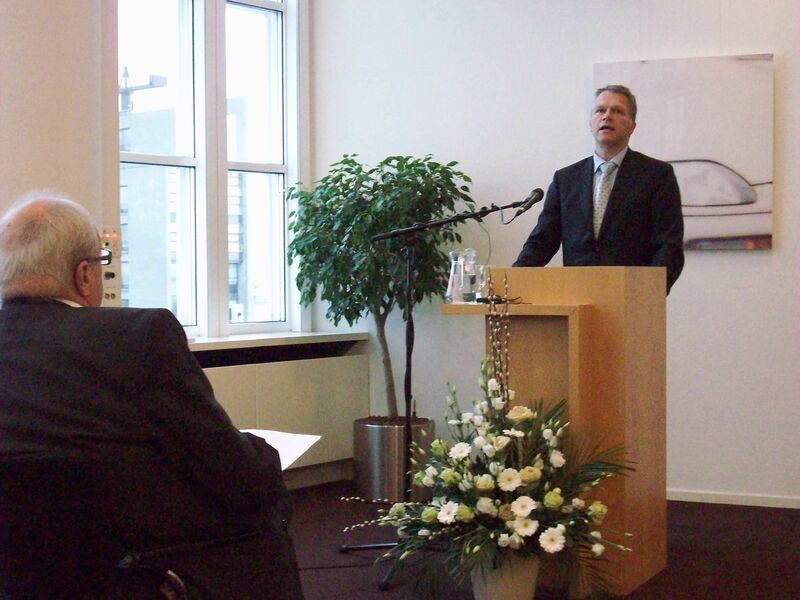 Europe is in luck, said a former Dutch Minister of Finance at the Association of European Journalists during the 11th Sicco L. Mansholt-lecture. During this lecture the Vice-premier throwed light upon European topicalities. The emerging situations in the financial industry made it a captivated afternoon. In the Hague, city of justice and piece, Keynes becomes fully alive on 12 November 2008 in a Europe that is taken for granted. In these days Europe is present and represents. There are uninhibited chances to provide Europe with new energy. We lost fatalistic trust in the free market operations. Trade became more important than the product itself. Another chance is unlearn the greed.More is not always better. More morality is needed. Self-cleaning ability of the financial institutions still fall short of the mark. Crisis started by a lack of cooperation, not by cooperation. Except the financial and economic crisis energy and climate were also issued. Einstein after the same questions within two years: the questions stay the same, but the answers have changed'. October 2008 the European Commission communicated From financial crisis to recovery: a European framework for action. The unprecedented crisis in international financial markets has created major challenges for the EU. Co-ordinated action at EU level by all 27 Member States has been effective in stabilising Europe's banking system. Implementation of measures has to be rapid. May 2008 'Financial markets can not govern us! It is time to set up an “European Crisis Committee” gathering high-profile politicians, former Heads of State and Government or Finance Ministers as well as renowned economists and financial experts of all continents. GEORGE SOROS lectured 17-04-2008: "MARKETS ARE NOT OUT OF TROUBLE YET" and presented his book: The New Paradigm for Financial Markets: The Credit Crisis of 2008 and What It Means. Socialism failed, communism failed and now regulations failed. It is a global thing, a not isolated and different crisis in the integrated economies on several (contradicted) levels. What we see now is a period of instability (and uncertainty). Maintaining stability has to be the objective of the authorities by a more semantic rule of regulations. Not only money supply but also credit supply and hedgefunds need to be controlled. There is a commodities bubble still in the growth phase. "I do not think that the euro can replace the dollar as the world's main reserve currency". In March 2008, it was ten years ago since the final decision to move to the third and final stage of Economic and Monetary Union (EMU), and the decision on which countries would be the first to introduce the euro. To mark this anniversary, the Commission undertook a strategic review of EMU. This paper, called 'Economic governance in an enlarged euro area' constitutes part of the research that was either conducted or financed by the Commission as source material for the review. From The Atlantic: the 6 Most Illuminating Quotes from the Fed's Pre-Crisis Meetings. A story of pride, prescience, and mild panic among the economy's keepers at the eve of this generation's worst recession. It was the end of the world as we knew it, and the Fed was feeling fine. Okay, that's not really fair. The transcript of the Federal Reserve's 2007 meetings, months before the economy entered its worst recession since the Great Depression, reveal an institution far from oblivious, with a few notable exceptions. They just didn't quite understand the labyrinthine web of financial interconnections until it was too late. Back in 2007, the credit crunch that became the Great Recession started when financial institutions realized it might not have been a good idea to loan money to people who couldn't pay you back. But with the economy roaring to new heights, the Fed wasn't in crisis mode -- yet. Panic in the financial markets certainly wasn't good news, but the Fed had managed to make it through similar panics in 1987, when the stock market fell almost a quarter in one day, and in 1998, when hedge fund Long-Term Capital Management nearly brought down the financial system, without the real economy suffering any harm. This time didn't need to be different. And, to be fair, the Fed was well aware of the risks piling up in the financial system as the clock ticked down to Lehman. It didn't even really make any big mistakes in 2007; those came later. So while it's easy to mock the Fed for saying Bear Stearns and Countrywide didn't have too much trouble getting liquidity in August 2007 ... but it was true at the time! They only ran into problems, the kind that drove them into bankruptcy and/or mergers, later. Below are the six most revealing passages from the Fed's pre-crisis meetings, with a key sentence of each quote underlined. Beyond the inflation hawks who managed to see price increases under every rock, they were mostly right in their analyses. They just weren't right enough. Or quickly enough. Our goal is to provide liquidity not to support asset prices per se in any way. My understanding of the market's problem is that price discovery has been inhibited by the illiquidity of the subprime-related assets that are not trading, and nobody knows what they're worth, and so there's a general freeze-up. The market is not operating in a normal way. The idea of providing liquidity is essentially to give the market some ability to do the appropriate repricing it needs to do and to begin to operate more normally. So it's a question of market functioning, not a question of bailing anybody out. This is what a central banker says when things start to hit the fan. The day prior, French bank BNP Paribas had sent the financial world into a frenzy when it announced it wouldn't let investors cash out of two of its subprime funds, because the bank had no idea what they were worth. Nobody would buy, and when that happens, the "price" is pretty much zero. But as Bob Peston of the BBC pointed out at the time, the scariest bit was that BNP Paribas itself didn't want to buy these bonds on the cheap. The bank wasn't sure they weren't totally worthless, too. And if banks (and shadow banks like hedge funds or special investment vehicles) were sitting on top of piles of genuinely worthless bonds, who would want to lend them? Answer: nobody, at least not without top-notch collateral. Hello, credit crunch. So I wouldn't say that a rate cut is completely off the table, but my own feeling is that we should try to resist a rate cut until it is really very clear from economic data and other information that it is needed. I'd really prefer to avoid giving any impression of a bailout or a put, if we can. Therefore, what I'm going to suggest today is to offer a statement updating our views of the economy that will give some signal about where we think things are going but to stop short today of changing rates. A week later, things weren't any better. Financial institutions still didn't want to lend to each other except against the best collateral, and markets still didn't exist for subprime securities. Bernanke's dilemma was whether to 1) just expand emergency lending to the banks, or 2) cut interest rates too. But with the real economy humming despite the financial turmoil, Bernanke worried the latter would look too much like a bailout (or a "put" option) for Wall Street. At the same time, this balance sheet pressure and worries about counterparty risk have led to a significant rise in term borrowing rates. Banks that are sellers of funds have shifted to the overnight market to preserve their liquidity, and this shift has starved the term market of funds, pushing those rates higher .... Moreover, the increased reliance by banks on overnight funding increases rollover risk and may limit the willingness of banks to expand their balance sheets to accommodate the deleveraging of the nonbank financial sector. This is one of the driest descriptions of financial armageddon you'll ever read. Let's translate it into English. Banks knew they were all sitting on top of toxic waste, but nobody knew who was sitting on the most of it -- so they wouldn't lend to each other, except at punitively high rates, for anything longer than a day. But relying on such overnight funding made the banks vulnerable to de facto bank runs, and that made vulnerability made them less likely to keep lending even as shadow banks cut back on lending. In other words, a credit crunch. And less credit just when borrowers most needed it meant more people would eventually go bust ... hurting mortgage bonds even more, and making banks pull back further. Loops don't get much more vicious. The possibilities of a credit crunch developing and of the economy slipping into a recession seem all too real .... I am particularly concerned that we may now be seeing the first signs of spillovers from the housing and financial sectors to the broader economy .... Although I don't foresee conditions in the banking sector getting as bleak as during the credit crunch of the early 1990s, the parallels to those events are striking. Back then, we saw a large number of bank failures in the contraction of the savings and loan sector. In the current situation, most banks are still in pretty good shape. Instead, it is the shadow banking sector-- that is, the set of markets in which a variety of securitized assets are financed by the issuance of commercial paper--that is where the failures have occurred. This sector is all but shut for new business. But bank capital is also an issue. Until the securitization of nonconforming mortgage lending reemerges, financing will depend on the willingness and ability of banks, thrifts, and the GSEs to step in to fill the breach. The Great Recession was just about to officially begin (although NBER wouldn't announce that until much later), and more members of the Fed were contemplating the Rube Goldberg machine of doom subprime had set off. As Yellen pointed out here, the shadow banking system was already in hibernation at this point, although it wasn't clear whether regular banks would be able to step in the breach and keep things moving. (Spoiler alert: They weren't). In particular, there are two scenarios that they go into separately--the housing correction scenario and the credit crunch scenario. I think that there's a very strong possibility those would come together because, if housing prices go down more, that creates a much more serious problem in terms of valuation risk, and a serious problem in valuation risk will mean a further credit market disruption, which then can lead to more macroeconomic risk because it leads to this downward spiral. The real economy gets worse. These are about the three most prescient sentences you'll find in the Fed transcripts. Miskin was concerned that subprime wasn't, as Bernanke had previously put it, contained, and that a further fall in housing would mean further damage to bank and shadow bank balance sheets, which would make them even less likely to lend. The ultimate danger, as Mishkin pointed out, was that this credit crunch would migrate from the financial to the real economy; that not just banks, but households too, wouldn't be able to borrow. The pyramid of debt that existed in 2007 was like a shark -- it had to keep moving to live. If households spent less because they couldn't borrow more, the economy would slow down, and more people would default on their debts. In other words, exactly what did happen would happen. Of course, it still wasn't clear how precarious the financial sector was beyond the shadow banks. Again, from Mishkin. You don't like to use the R word, but the probability of recession is, I think, nearing 50 percent, and that really worries me very much. I also think that there's even a possibility that a recession could be reasonably severe, though not a disaster. Luckily all of this has happened with an economy that was pretty strong and with banks having good balance sheets; otherwise it could really be a potential disaster. I'd like to address the inflation situation more thoroughly, Mr. Chairman. The CEO of Wal-Mart USA said that, for the first time in his career at that firm, they have approved a plan in which purchase costs will increase 3 percent in '08. He hadn't seen that before in his experience and said, "I'm totally used to deflation. Deflation is finished." In terms of the suppliers to Wal-Mart, this was verified. I think on food prices we have to be extremely careful. Frito-Lay is seeking a 51⁄2 percent price increase for next year. Wal-Mart has acquiesced. No, I didn't make this one up. And yes, just as the biggest deflationary spiral in 80 years was about to hit the economy, Fisher was worried about inflation. And he was worried about inflation, because ... Frito-Lay was thinking about increasing prices 5.5 percent the following year. This is not a joke. Well, it is a joke, but, again, not one that I made up.